Following a successful tour in Africa and in the US, Embraer is now beginning the European and the Commonwealth of Independent States (CIS) part of the E190-E2 worldwide demonstration tour. The aircraft will visit more than 15 countries during September. At each stop, Embraer will show the capabilities of the world’s quietest, cleanest and most efficient new generation single-aisle aircraft in the segment. The first stop on the European tour is in Warsaw, Poland. 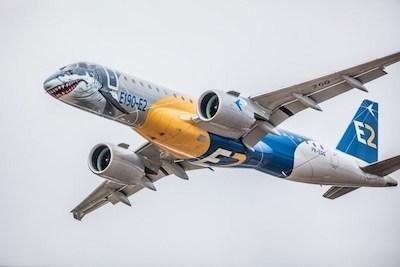 The E-Jets E2 are the most efficient family of aircraft in the single-aisle market burning up to 10% less fuel than its direct competitor, Embraer claims. The E190-E2 brings also more flexibility with maximum range of up to 2,860 nautical miles, or about 540 nm longer than current generation E190. The E190-E2 also obtained better results than initial expectations in pilot transition training time. Pilots of current generation E-Jets need only 2.5 days of training and no full flight simulator to fly the E2. “Decreasing the training burden for pilots transitioning from E1 is another huge reduction in both time and cost for our operators. This coupled with the unmatched fuel efficiency and lowest noise footprint, making the E2 the most cost-effective and most environmentally friendly single-aisle jet in the planet, we see the aircraft as the natural evolution for many Embraer operators in the region," explained Holmes. Embraer forecasts 2820 commercial aircraft up to 150 seats to be delivered over the next 20 years to European and CIS operators. As the European intra-regional airline industry moves from a business-model dynamic of “Low Cost Carriers versus Full Service Carriers” to a single hybrid consensus, the E-Jets E2 will play an increasingly important role in the region. Beyond its traditional hub-feeding operation, the E2 will have a further outreach in LCCs experimenting FSC’s strategies such as multi-fleet type and focus on business passengers.